Their romance shaped a nation. The rest was history. I was really unsure about Alex and Eliza because I’m not a fan of the musical Hamilton – really, I’m just not a fan of musicals at all. However, I think anyone can enjoy Alex and Eliza even without knowing a single thing about the musical. Though I do think Hamilton fans will just adore this book. I gave Alex and Eliza a try because it is a love story and we all know how I feel about romance, yes, even YA romance. I won’t say I fell in love with this book, but I did end up liking it. Surprisingly enough I liked it more because of the history than the romance. 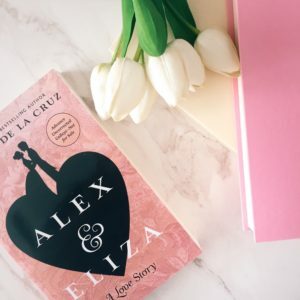 Maybe it was because of the creative liberty the author had to take on Alex and Eliza’s lives, but I just did not connect with the romance. I felt no chemistry, which saddens me because that’s the whole reason I picked up the book. I found the most enjoyment in reading about the time period. I love reading historical fiction and the descriptions of clothing worn, hair styles done, events that occurred, and buildings that were around. Some might say those parts are slow and boring, but I found them interesting. It was cute enough and entertaining enough to enjoy, but Alex and Eliza isn’t a book I’ll remember. I received this book in exchange for an honest review. This does not affect my opinion of the book in any way.